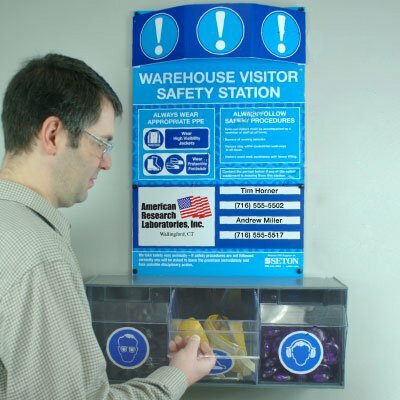 Safety Posters and Wall Charts display safety information in a clear, organized and highly visible manner. Workplace Safety Wall Charts and Safety Slogan Wall Charts keep all safety information neatly organized on one large Wallchart. OSHA Compliance Posters, OSHA Safety Posters and Federal and State Labor Law Posters provide employees with necessary employment and safety information in one convenient area. Posters & Wallcharts are used to convey various messages and information for safety, security or awareness purposes. Seton offers its customers a variety of Posters and Wall charts for first aid and rescue procedures, safety practices, safety procedures, lockout/tagout/ chemical hazards, Right-To-Know and more. Choose from Good Housekeeping Workplace Safety Wallchart, Arc Flash Workplace Safety Wallchart, Thank You for Working Safely Safety Slogan and more.